Present Truth is a monthly newsletter with a focus on the plan of redemption. It is available in printed form and is sent free upon request. If you would like to receive a sample issue or request to have your name added to the mailing list contact Present Truth Fellowship. To read the current or any back issue of Present Truth in HTML format click here. 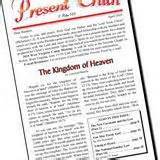 To view a list of studies printed in Present Truth see the links below. To view or print Present Truth in Portable Document Format (PDF) click here. The following is a list of studies that have been printed in past issues of Present Truth. If you would like to view any of the articles listed just click on the appropriate date for the newsletter you wish to view. Click on the year to jump quickly to that section. May 21, 2011 – What Happened? Has God Abolished His Law? Did Christ Exist Before Bethlehem? What Did Jesus Teach About God? Must We Use Hebrew Names to be Saved? Wars and Rumors of Wars: Is it the End? Is the Sabbath worth “arguing over a day”? What part of Jesus died? How do two beings make one God?